There’s no denying that barn weddings are popular, and it’s easy to see why. Many are steeped in history, giving a classic vibe that transports you back in time. The surrounding landscapes are often stunning, with gardens and countryside, lakes and rivers, they can be absolutely anywhere, adding a little extra to your wedding photos. The rustic charm doesn’t hurt either. But arguably the real appeal is that they’re often a blank canvas, allowing you to do things your way and showcase your own personality as a couple. Whether you want it formal or informal, modern or traditional, choosing a barn is the perfect step to having a unique wedding day. If you find yourself asking ‘where can I find barns to get married in near me?” then check out this list of great barn wedding venues and be sure to take a peek at the photos – you might be surprised just how amazing these can look with a little creativity. On the banks of River Blackwater in Hampshire is this beautifully bright and contemporary barn wedding venue. Being a waterside venue, and with it’s lovely gardens, it’s certainly not lacking in stunning views, but it’s the interior that really does it justice. With high ceilings, oak beams, modern décor and plenty of natural light pouring in, it has a spacious feeling that might make you forget it’s actually a barn. Near the market town of Atherstone is another stunning contemporary barn, Mythe Barn. Elegance and sophistication come to mind with this venue, with its chandeliers and light and airy space. Have your ceremony in the two storey Oak Barn, fit with a minstrels’ gallery for your musicians, or take it outside for a romantic ceremony under the gazebo. Head to the Cart Barn or the Courtyard for fancy drinks and canapes from the talented Galloping Gourmet in-house caterers. For a more rustic feel, the 17th century Kingscote Barn in the Cotswold Hills offers Cotswold stone walls and exposed oak beams. Kingscote offers slightly more intimate feel, despite seating 150 people. In an area of outstanding natural beauty, it’s the scenery outdoors that makes this venue shine. Have your ceremony outside under the stunning Oak Linhay and experience the idyllic views of sprawling green landscapes that it has to offer. This fabulous Stone Barn is also in the Cotswolds and is the perfect combination of rustic and modern. From fire pits to fairy lights and even a huge barbeque, it has a cosy yet stylish feel that makes it stand out as an incredible wedding venue. It also has street food. Yes, street food! For a fresh and urban twist on wedding food, Stone Barn offers a delicious menu from award-winning sourdough pizzas to bao buns that your guests are sure to love. 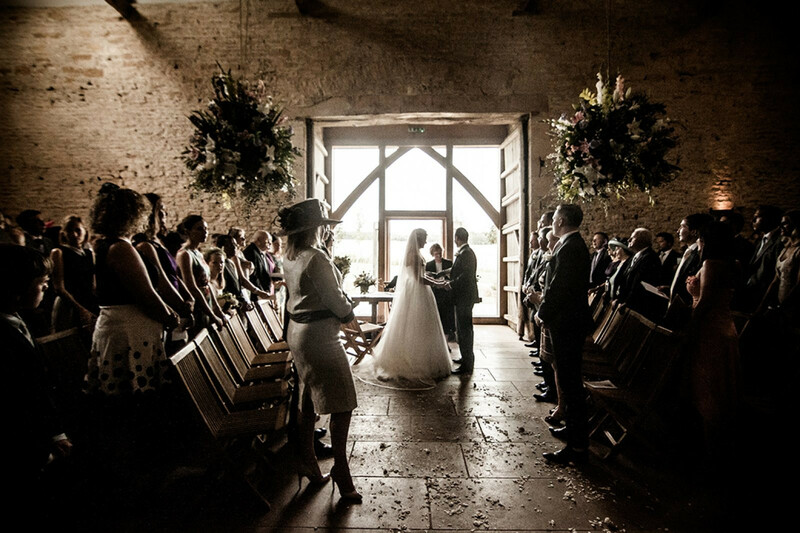 From Cripps & Co, the people behind Stone Barn, is another amazing Cotswold barn venue. This one is beautifully romantic and traditional, full of magic as if it belongs in another world. With a majestic timber frame, sweeping flagstone floors and an open fireplace it’s sure to be perfect for those all-important wedding photos. Or, if you’d rather, get married outside in a wonderful woodland glade. As the original party barn of the company, you’re sure to have a good time with drinks and street food, and when it’s all over, why not pitch a tent and camp in the grounds? In rural Warwickshire are these 18th century red brick barns with an air of elegance about them. It’s perfect for a relaxed rustic wedding, with a stylish twist. Enjoy a drink in the viewing gallery, take a break at the copper-topped bar, watch the rotisserie turn or head outside to the BBQ. The courtyard is a wonderful addition, full of character, with fire-pits and ancient olive trees. A dance floor and party space top off this great venue. Hazel Gap in Nottinghamshire features two red-brick barns, with two spectacular towers with arched entrances for a venue your guests won’t forget any time soon. The barn is host to a grand fireplace and giant candelabra for added elegance, which becomes a dance floor as the night approaches. In the centre, a brilliant courtyard with a romantic sandstone fountain at its heart, great for those post-ceremony celebrations. At night, watch as it transforms into a magical area of dramatic flares and fire-pits to add that extra wow-factor to your big day. In the stunning landscape of Northumbria is the fifth and last of the Cripps barns on this list, Healey Barn. A collection of traditional stone farm buildings with rustic timber-framed ceilings, Healey offers a romantic spot for weddings, whatever the season. The Long Barn features the signature roaring fireplace you can expect to love from a Cripps barn, along with grand candelabras and a fairy-lit ceiling for an enchanting setting. With breath-taking views, it’s sure to be a place you’ll remember. Nestled in the Norfolk countryside, are two great venues for you to choose from: Brasted’s and Langley Abbey. Brasted’s barn is a flexible space for you to tailor to your needs, with a bar, dance floor and terrace you have all you’d need for a spectacular party after the ceremony. With Brasted’s Lodge providing luxurious accommodation and award-winning food, it will certainly be a worthwhile stay for your guests. Alternatively, you could also get married in the magnificent Langley Abbey for a more historical setting. This Grade II listed building in Staffordshire rests in the foothills of the Peak District, making it a fantastic location for sweeping landscape shots and leisurely strolls. With formal gardens, lawns and ponds there’s plenty of sights to admire, but the wildflower meadow and lower lake are truly something to behold. You’ll have exclusive use of the two barns, the Wedding Night Suite and the Stables Dressing Room, as well as the surrounding grounds. If that wasn’t enough, it’s also a no corkage venue, allowing you to bring your own drinks without a charge. Overlooking a Cotswold valley are these hidden restored barns and buildings, perfect for flexibility, allowing you to have exactly the wedding you’ve been dreaming of. With a beautiful courtyard at its centre, and control over the decorations and functions of the surrounding modern, yet thoughtful barns, you’re sure to create a unique and memorable wedding day with this blank canvas. The main barn, the Threshing Barn has only recently been turned into a venue, so it has a uniquely authentic atmosphere. Just outside the heart of Oxford is this former grain store barn, transformed into a modern and spacious venue. Say “I do” in the Hayloft Gallery, while overlooking the main hall. Or, if outside is more your thing, take advantage of the wooden pagoda with views of a willow tree pond and lakes for a romantic ceremony. Up to 28 guests can enjoy on-site accommodation, featuring a heated pool and tennis court, for a more relaxing setting. In the picturesque Berkshire countryside is Wasing Park, an elegant estate with plenty of potential. Have your ceremony outside in the Victorian Summerhouse to add a fairytale feel to the day, or head into the stunning Garden Room to enjoy the abundance of natural light. The Castle Barn is where the party begins, with grand arches and brick interior, it acts as a blank canvas to give you the choice of what you want. A beloved family home for generations, Blackwell Grange has recently opened its doors to couples looking for a stylish wedding barn to make their day special. A perfectly thought-out fusion of old and new, the Orchard Barn is a contemporary area for your evening celebrations, with a volcanic rock topped bar to greet your guests, and plenty of windows to let in natural light, it’s a great place to grab a drink and look out onto the countryside. The Thatch Barn offers a rustic, yet dramatic location for your ceremony, and the Potting Shed is the perfect place for the bride and bridesmaids to get ready. For a unique Cambridgeshire wedding, Bassmead Manor Barns provides a rural and idyllic location for your big day. Standing within a medieval moat of an ancient manor house is this charming family-owned barn for a touch of history and heritage. Have your ceremony in a 300-year old Rickety Barn, which is full of character, featuring a little nook upstairs for a photographer or musician to show off their talents. The stylish and modern Moat Barn offers a great location for your reception, with a backdrop of lush fields just outside. This Grade II listed venue in the Thames Valley rests in the original surroundings of a medieval manor house. For one of the largest listed barns in the south of England, the Great Barn offers a spacious location for your wedding or dinner. The Small Barn is a chic venue perfect for smaller parties or welcome drink. On a sunny day, the Cloister Garden is the perfect place for your ceremony, or for having an English vintage reception. For a no-corkage venue on the waterside of the Shropshire-Worcestershire border, The Mill Barns is a collection of three interconnecting barns in eight acres of beautiful gardens. With amazing water features and a walkway, this previously 17th century water mill, is now a spectacular sight, and even appears to be floating on the surface of the water, with reflections making it truly eye-catching. For a tranquil and magical wedding day, The Mills Barns is one to consider. For a traditional Hampshire barn with a memorable thatched clock to let people know they’ve arrived at your wedding, Clock Barn offers beautiful surroundings and rustic charm. The traditional barn offers plenty of period charm, with high ceilings, oak pillars and wrought iron chandeliers, or for a little extra magic, have fairy lights wrapped around the beams making it a warmer and intimate atmosphere. Set in 100 acres of parkland, enjoy the Norfolk countryside at the lost village of Godwick for a unique 450-year old Grade II listed Great Barn. Maintaining its rustic authenticity, it also has tastefully modern additions to make your wedding day comfortable. The barn features a high-pitched roof so prepare be impressed by the acoustics, as beautiful music fills the room. For a more intimate wedding up to 30 guests, Godwick Hall offers both an informal drawing room and dining room for a warm and cosy day with your closest friends and family. Nestled between the sacred groves of ancient woodland is Hayne Devon, this historic 17th century Threshing Barn lies in heard of 25 acres of grounds and gardens. Created by musicians Tim and Milla, their experience as a wedding band makes them best placed to making your big day special. It’s a relaxed and soulful venue, perfect for anyone wanting to combine rustic-chic with state of the art lighting and sound and a fully stocked bar. Located in a historic private family estate in Essex is Gaynes Park, a stylish and contemporary wedding venue. With the London skyline in the distance, and British countryside all around, it’s the best of both worlds, and easily accessible. Enjoy the views of the glass Orangery from a light and traditional ceremony space. Or, head to the Gather Barn, with open sides making it feel like an outdoor ceremony, with plants and trees to add a natural vibe. Oxleaze Barn is located at the heart of a thriving organic Cotswold farm, with traditional stonework and exposed beams to disguise the state of the art technology that powers this venue. With underfloor heating and stunning lighting, you don’t have to sacrifice comfort on those winter nights to enjoy the aesthetics of the original features. Only hosting one wedding a weekend, means it’s all about you. Within Cornish farmland, minutes away from the beautiful Talland Bay beach is Trenderway Farm. The 200-year-old Cornish stone barn has plenty of rustic charm, with its whitewashed walls and solid oak floors and the Oak Bar upstairs for all partying needs. Step outside into the spacious marquee and enjoy the backdrop of glimmering lakes and lush greenery for a tranquil location for your wedding photos. Click here to check out more fantastic barn wedding venues near you.